During WWI, thousands of women served in auxiliary military units, such as the “Hello girls” attached to the U.S. Army Signal Corps in France, but by the time WWII was over, hundreds of thousands of women had donned uniforms to serve at home and abroad. Women’s Auxiliary Army Corps (later the Women’s Army Corp): This organization was instituted by Congress in May, 1942. In July, 1943 the group was converted to active duty status, able to receive full military benefits. Headed up by Oveta Culp Hobby, a prominent Texan who later became the first secretary of the Department of Health, Education, and Welfare, the WAACs were modeled after comparable British units such as the ATS. Initially, the women were trained in three specialty areas: switchboard operators, mechanics, and bakers. Eventually, training would expand into dozens of specialties. 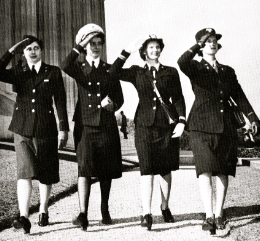 Over 150,000 women served in the WAACs, most of them stateside. Women Accepted for Voluntary Emergency Services (WAVES): Created in July, 1942, the WAVEs were led by Mildred McAfee, on leave as President of Wellesley College. WAVEs served on one of 900 U.S. naval stations, the only “overseas” post being the territory of Hawaii. Female officers took over positions formerly occupied by men such as physicians and engineers, while enlisted women served in jobs from administrative and clerical to parachute riggers. Just under 90,000 women served in the WAVEs. 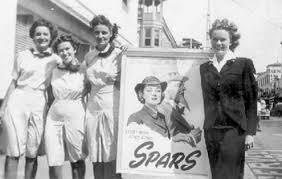 United States Coast Guard Women’s Reserve (SPARS): Created in November, 1942, the SPARS, whose name was taken from the motto “Semper Paratus” (always ready), were recruited as part of a joint effort with the Navy and Marines. The partnership did not work out, and the Coast Guard withdrew from the agreement in July 1943. The leader was Dorothy Stratton, on leave as Dean of Women at Purdue University and a lieutenant in the WAVES. She was promoted to Lieutenant Commander and later Captain. The SPARS were assigned to every USCG district except Puerto Rico serving as general duty officers, drivers, clerks, parachute riggers, and a select few worked with LORAN (a top secret radio navigation system) at monitoring stations. About 11,000 women served in the SPARs. US Marine Corps Women’s Reserve: The only women’s group not to feature a catchy name or acronym, the WR was authorized by Congress and signed into law by President Roosevelt in July 1942, but the Marine Corps delayed formation of the group until February 1943. The group’s purpose was to release men for combat – their recruiting mantra: “Free a Marine to fight.” A graduate of Bryn Mawr College and already part of the Reserve, Ruth Cheney Streeter, was chosen as their leader and sworn in as a major. The Marine Corps listed over two hundred specialties, but over half of the WR members served in clerical positions. Until 1944, the WR were prohibited from serving outside the continental United States, and then only in the Territory of Hawaii. At its peak, the Women’s Reserve had over 19,000 members. 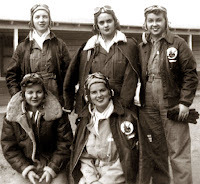 Women’s Airforce Service Pilots (WASPS): Created in August, 1943 by the merge of the Women’s Flying Training Detachment (WFTD) and the Women’s Auxiliary Flying Squadron (WAFS), the WASPs was a civilian organization whose members were U.S. Federal Service employees. Over 25,000 women applied, but only 1,830 were accepted, and 1,074 competed the training. Working with the U.S. Army Airforce (the two were still one organization at this time), WASPs freed men for combat or other military duties and transported military aircraft, towed targets for live-ammo training, simulated strafing missions, and transported cargo. 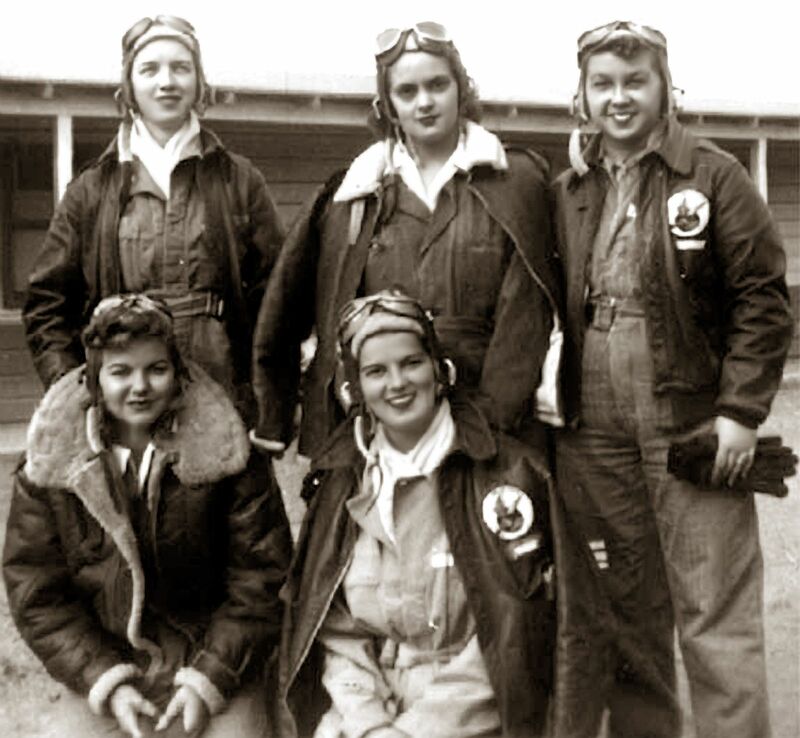 Serving only in the U.S., the women were stationed at one hundred and twenty two air bases. The program was disbanded in December 1944. In 1977, a bill signed by President Jimmy Carter awarded the WASPs military status. U.S. Army Nurse Corp (ANC): Formed in 1901 by Congress, the ANC is one of six branches that make up the Army Medical Department, and is comprised entirely of Registered Nurses who are commissioned officers. At the start of WWII, there were fewer than 1,000 women in the ANC. Recruiting efforts targeted single, white women between the ages of 22 and 30 who received their training from civilian schools. Members who got married or became pregnant were discharged. It was not until February 1944 that ANC nurses received actual military ranks. Approximately 54,000 women served in the U.S. Army Nurse Corps. U.S. Navy Nurse Corp (NNC): Congress formed the U.S. Navy Nurse Corps in 1908, however multiple sources indicate that women had been serving unofficially for decades, perhaps even a century. In addition to regular nursing duties, NNC members training Hospital Corpsmen who were sent to work aboard fighting ships and on invasion beaches, because women were not yet assigned at those locations. NNC nurses were also trained in surgery, orthopedics, anesthesia, contagion, nutrition, dietetics, physiotherapy, and psychiatry. Serving on six of the seven continents and islands around the globe, the Navy Nurse Corps had nearly 12,000 members. Which group would you choose to serve?